Fenwick Island Vacation Rental – Bayside, 30220 Candleberry Drive | Fenwick Island Fenwick Island Rentals. Exceptional and spacious absolutely awesome 5-bedroom plus den, 4 bath vacation home in the newest section of West Fenwick's Bayside Resort! An easy bike ride to the Sun Ridge pools, tennis and fitness facilities. A fantastic place to launch your family's beach adventures, this amazing luxury home features TVs in every room, including a 75-inch screen in the living room. 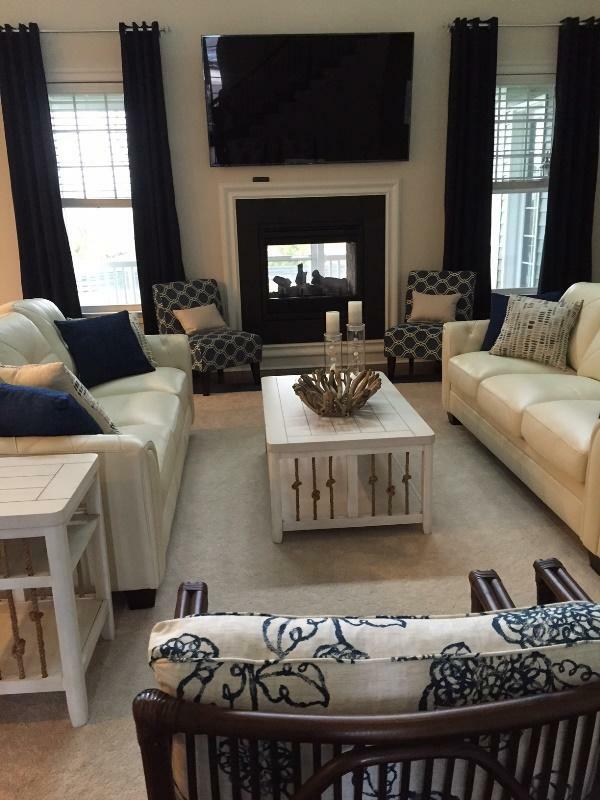 All new furniture, hardwood floors throughout the first floor and even a small back yard with a view of the lake! Cool fireplace that's visible from the living room and the screened porch! Amenities include Central air conditioning, washer and dryer, 7 TVs (all flat screens,), DVD, Gas fireplace, Gas grill, Wireless Internet and more. Plenty of Parking for 6 with two-car garage, driveway, plus a Tesla charging station is now available! This waterfront golf resort community offers a quiet escape just minutes to the beach, and a short drive to Ocean Downs where you can experience a night out cheering for your horse trotting to the finish line. The Ocean Downs Casino features gaming tables, slots and much more. Another must see is the Assateagues Island of Wild Horses also minutes away and Delaware offers "tax-free" shopping so don't miss the Tanger Outlets conveniently located in minutes away. We have fabulous amenities too - including its 18-hole Jack Nicklaus Signature Golf Course, with pro shop and newly opened 38 Degrees Bar and Grille at the Point overlooking a beautiful view of Ocean City. Beautiful house. Everyone in the family loved the community and the house from 2 - 52. So much to do. Best family vacation. Will be back again next year for sure!